This is a curious laptop for which there is little information online. Made in Taiwan, it appears to have been sold mostly in Europe (based on the locations of websites where infomation is available), and is notable for its unusually modular design. I have made another page (approx. 1MB) documenting the process of reassembling the laptop after replacing the BIOS battery, which in my model requires complete disassembly. This same model of laptop seems to have been sold under a number of brand names, mine is from "Dual Group" who, whatever their history, don't appear to have much of a Web presence these days. The removable section near the top right of the keyboard appears to allow for a variety of expansion devices. 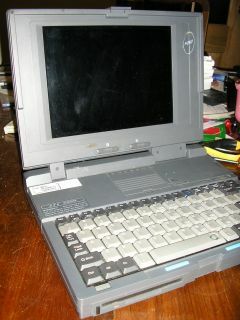 In my model it has a PCMCIA module with two PCMCIA ports accessible from the side of the laptop. In pictures online, it can instead be seen with a trackball installed, and even some unknown adapter which presents two D-type sockets pointing upwards (shown in the Italian link below). Specs and pic with mouse ball instead of PCMCIA. I don't have a manual for the laptop. If someone wants to send me a digital copy, I would be happy to host it here for download.